Translated from article in Yomiuri America, March 13, 1998. Seventy-one years ago, 58 dolls crossed the ocean to the United States as a return present for the American gift of blue-eyed dolls to Japan. Those 58 dolls sent to the U.S. were named after prefectures in Japan. While Japanese-U.S. relations grew strained, the dolls were given as a goodwill gesture between the two nations. During and after the war, however, a few dolls were burnt in fires, and the whereabouts of some dolls became unknown. The locations of 40 dolls have been confirmed, and Miss Chosen, the 41st one, was recently found in Connecticut. Because this doll was given during the period of Japan's annexation of Korea (Chosen in Japanese) from 1910 to the end of World War II in 1945, it was named Miss Chosen. Many Friendship Dolls have made a homecoming visit to Japan after numerous years abroad. However, kimono-clad Miss Chosen no longer has a home to which to return. Noriko Gordon, who lives in Cromwell, Connecticut, read an article about Miss Hyogo's homecoming to Japan in the January 18, 1997 issue of the Yomiuri Shimbun. She contacted Michiko Takaoka of the U.S. branch of Mukogawa Women's University and the director of the Japan Culture Center in Spokane, Washington. Friendship Doll reference materials that Mrs. Gordon received from the Japan Culture Center motivated her to begin a search for a doll. Mrs. Gordon mentioned the story about the dolls to her friend, Mr. Bob Hunter, who is studying Japanese at Central Connecticut State University. By chance, he heard from his neighbor, Mrs. Leda Frank, 77 years old, that she had seen a Friendship Doll in the Children's Museum in West Hartford, Connecticut. She had taken her children to the museum over 30 years ago to see the doll. Mr. Hunter confirmed with a phone call his recollection that the former Children's Museum had changed its name to the Science Museum. When he inquired about the doll [name changed back to The Children's Museum in 2006], he found out the doll was being kept in a museum storeroom. Mr. Hunter visited the Science Museum this year with Mrs. Frank and Mrs. Gordon on January 30, and they met with Miss Chosen. According to Mrs. Gordon, the doll was lying in a large cardboard box with Miss Chosen's passport and newspaper articles from the time of her arrival in the U.S. The color of Miss Chosen's kimono was faded, and her hair was unkempt, but the doll seems to have been kept in good condition. Francine Christiansen, head of public relations at the Science Museum, describes finding the doll, "Nobody knew that a doll had been kept for such a long time. After I received the telephone call from Mr. Hunter, I searched for the doll in the museum's storeroom. I was surprised to find the beautiful Japanese doll. 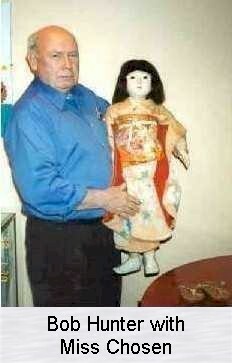 We are now thinking of displaying the doll to the public." The 58 dolls were given to the U.S. as a return present in response to 12,739 blue-eyed dolls presented by American Dr. Sidney Gulick as a gift to Japan in 1927. In the 1970s, some of these dolls began to make homecoming trips to Japan for their repair. Cultural exchanges also began between the American towns which sent blue-eyed dolls and the corresponding Japanese towns that received the dolls. Also, exchanges of new dolls began in many other towns. Tiny "Doll Ambassadors" began to gradually accomplish their missions that they could not carry out before the war. Recently, Miss Nara found in Boise, Idaho, and Miss Hyogo found in Missouri made their return to home in 1994 and 1997, respectively. Miss Hyogo was warmly welcomed by the citizens of the prefecture of Hyogo after the devastating earthquake there. Mr. Hunter, who phoned the museum and verified the doll's location, explains, "I was glad to know that the doll was kept with care. Past history cannot be changed. I hope as many children as possible will get a chance to see this admirable doll." Noriko Gordon explained with deep emotion, "I had mixed emotions when I saw the doll. Living in the U.S. for the past four years has changed my perspective on Japanese history. Because connections between individuals create connections between countries, I find great value in the history of the doll exchanges." Among the 41 dolls that have been found, Mrs. Takaoka of Mukogawa Women's College and the director of the Japan Culture Center has visited 39 of the dolls. She said, "Besides Miss Chosen, there are three more dolls, Miss Sakhalin, Miss Taiwan, and Miss Kanto-shu, who have lost their hometowns. It seems difficult for them to make a homecoming, since there is no hosting town in Japan for these dolls. It would be wonderful, however, if they can now meet with many Americans in their role as Japanese goodwill ambassadors."